Windmill Bakery is a family owned business with expertise in all types of bakery and pastries; serving various sectors of industries from hotels, restaurants, deli's to catering and many others. Windmill Bakery is equipped to make custom orders the way you want it with prompt service. From beignets to croissants and tarts, we are fully equipped to produce small batch to wholesale quantities. Servicing from private occasions to complete corporate services, let Windmill Bakery be your one stop service. Please inquire about our specials. Donuts, bagels and muffins are one of our regular line of production as well. 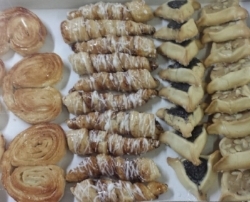 If you own a business, and would like to offer delicious breakfast pastries to your customers, please try our prompt delivery service to meet your needs. We service special occasions and catering products as well. From holiday cookies, pies to wedding cakes, we can customize to meet your needs in any way you like. Please don't hesitate to call and inquire about our private services.